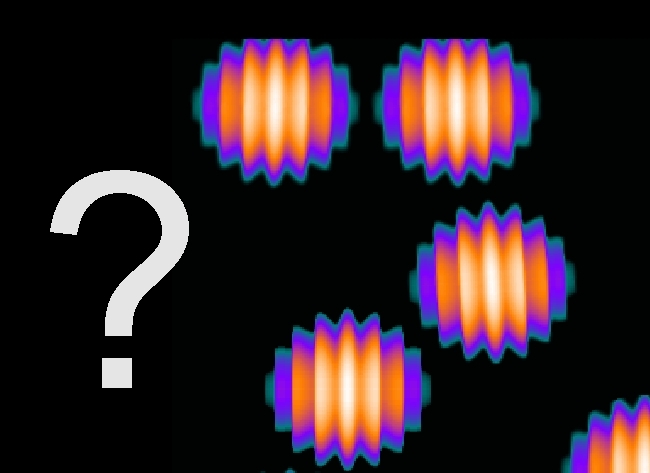 We love nanoparticles because they are weird. 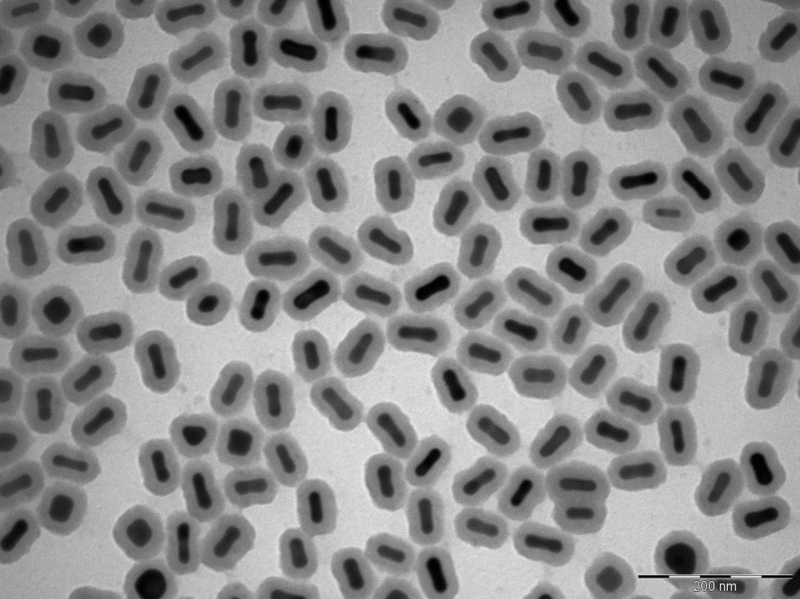 Gold nanoparticles solutions look like red wine… and turn to blue upon aggregation. Iron oxide nanoparticles form ferrofluids which can be spectacular if you have a strong enough magnet (see the Sixty Symbols video from Philip Moriarty). These physical properties are not just fun: they can be harnessed for imaging and tracking of molecules and cells. Furthermore, the nanoparticles can be camouflaged so that they look similar to biomolecules. This can be achieved by attaching many small biomolecules to their surface. The two main aims of our research are to prepare nanoparticles with advanced structures and functions and to develop biological imaging at various length scales. For this second aim, we do use nanoparticles but we do not restrict ourselves since there is a lot that can be done with other types of probes. The research is highly interdisciplinary (physics, chemistry and biology) and this is reflected both by the composition of the group and the breadth of our collaborations. The surface functionalization of nanoparticles dictates their interactions with biological systems. It must provide colloidal stability as well as a number of other properties depending on the envisioned applications (sensing, targeting, delivery, etc). Nanoparticles, and in particular gold nanoparticles, have a long (and often forgotten) history of applications in Biology. As early as 1912, Carl Friedrich August Lange invented a diagnostic test that used the colour change of gold nanoparticles to detect central nervous system diseases such as "dementia paralytica". 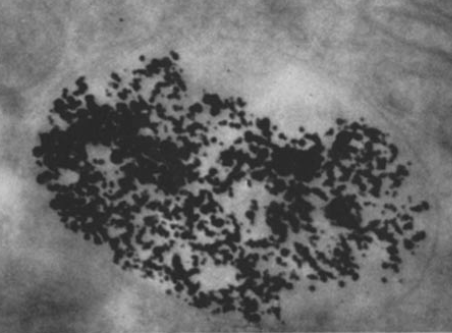 Much later in the 1950s, researchers including Esther Parker used gold nanoparticles to study cell trafficking (image below from previous reference). It is quite common for nanoscientists, to look to Nature for inspiration and to describe their pet nanomaterials as “biomimetic” or “protein-like” (as I have just done above). The surface of peptide-capped gold nanoparticles is made of the same building blocks (amino acids) as proteins so the comparison is justified to some extent. But, proteins are not a random bunch of amino acids. They have precisely determined 3D structures that are essential to their functions. We have tried to bring in some of this complexity first by studying mixtures of peptides which can form domains and then by introducing peptide motifs from amyloid proteins which result in (curvature-dependent) secondary structure. This is still work in progress and there is plenty of room for more work before we achieve a truly protein-like nanoparticle through self-assembly of peptides on nanoparticles. One avenue to better understand these systems is molecular dynamics simulations. The stripy controversy is the topic of many blog posts at the rapha-z-lab blog. You will also find there links to external coverage of the controversy. Our latest paper on the subject can be found here. Understanding and controlling the interaction of nanoparticles with cells is a pre-requisite for their use as imaging probes as well as in more advanced applications such as sensing and delivery. We have confirmed (nearly 60 years after Esther Parker and her collaborators!) that gold nanoparticles and super-paramagnetic iron oxide nanoparticles enter Hela cells by endocytosis and, more importantly, we have also shown that ligands on the nanoparticles get degraded by proteolysis. Furthermore, endocytosis results in particles which are trapped in vesicles. A number of applications require nanoparticles diffusing freely in the cytosol and this challenge has been addressed in numerous papers. One proposed route relies on the nanoparticles carrying cell penetrating peptides, while in our hands this resulted in increased uptake, no significant cytosolic localisation was seen (you can read the paper here). We use this technique to image nanoparticles in cells (see the three articles mentioned in the paragraph above) and it is also one of the motivation for our nanoparticle work since it enables stable imaging and tracking of single nanoparticles. We have two microscopes, the first built by Yann Cesbron and the second by Lara Bogart with further development by Dan Nieves and Dave Mason. They are based on Berciaud et al. (Brahim Lounis, Bordeaux). Some nice explanations of the photothermal microscopy can also be found on the MONA website of Frank Cichos (Leipzig). 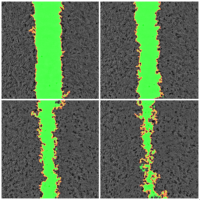 We are currently using this technique for the detection of fast moving protein-labelled nanoparticles at the surface of cells (you can read the paper here and see the data on Figshare). This project is at a very early stage. Jennifer Francis has recently taken up a CASE PhD studentship (in collaboration with Carl Zeiss) where we plan to develop and implement this super-resolution approach and apply it to some interesting Biological problems. The quantification of imaging data is an important but often overlooked aspect of imaging-based research. Funded through an MRC Next Generation Optical Imaging Initiative, Dave Mason is involved in developing bespoke software, scripts and protocols to support users of the Centre for Cell Imaging. We do the majority of the image analysis work with the powerful and open-source Fiji. Data analysis tends to be done using a spreadsheet application or MATLAB as required. You can read more about Image Analysis at Post-Acquisition (Dave's Blog). 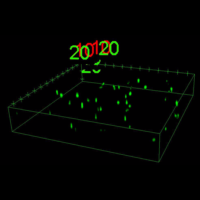 Lightsheet fluorescence microscopy is an imaging technique with an intermediate optical resolution but that allows imaging of rapid processes and provides good optical sectioning. 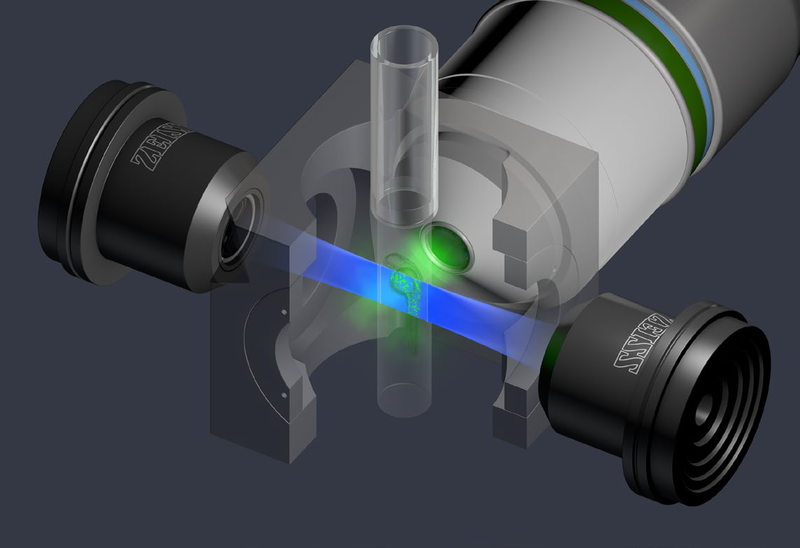 For illumination, a laser lightsheet is used to perpendicularly (to detection) illuminate a small portion of the sample thereby vastly reducing photodamage and phototoxicity effects within the sample. Samples can be of considerable size (up to a few millimetres) and freely rotated around the gravitational axis. In collaboration with Patricia Murray’s group, we have adapted the well-established 2D(ish) kidney rudiment assay into a 3D spheroid-based assay. We aim to screen stem and progenitor cells for their nephrogenic potential. 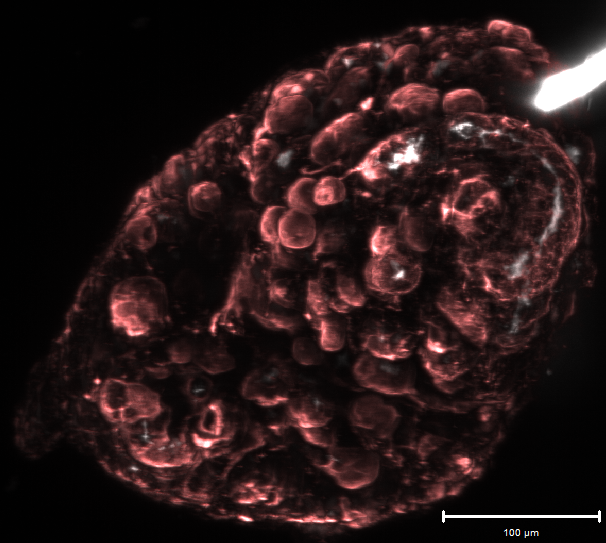 Spheroids containing mostly mouse kidney cells and a portion of stem cells are formed and can be imaged at several time points in an attempt to follow the fate of the stem cells as the mouse cells re-organise into kidney substructures such as tubules and glomeruli. Spheroid presenting with nephronic tubules. 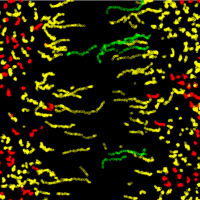 The outside of the tubules is labelled in red, the inside in white. Loading SPIONs into stem cells, allows them to be tracked non-invasively using Magnetic Resonance Imaging (MRI). As part of the UK Regenerative Medicine Platform safety hub, we have an ongoing collaboration with the Rosseinsky and Adams groups on synthesis of these materials and in particular the characterisation of their entry into cells. GNRs are excellent candidates to be used as contrast agents for in vivo imaging due to their optical properties, showing a high absorbance in the near-infrared. Interestingly, this is the region of the electromagnetic spectrum in which endogenous absorbance and therefore scattering, is minimal. 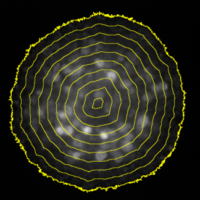 In collaboration with Mathias Brust, Joan Comenge is leading a project to label stem cells with GNRs and track them inside the organism using Multi Spectral Optoacoustic Tomography (MSOT). You can read his latest paper on the subject here. Transmission electron microscopy image of GNRs coated with a silica shell to prevent plasmon coupling. Briefly, MSOT irradiates the sample with a pulsed laser at different wavelengths, the energy is absorbed by GNRs which heat up and produce a thermoelastic expansion that ultimately leads to generation of ultrasounds which can be detected by transducers. The advantage of this novel technique is that it uses light to excite the GNRs, but it detects ultrasounds. Thus, it has the sensitivity of optic techniques, with a great resolution (150 μm) at depths up to 5 cm. We are funded by and would like to thank the Biotechnology and Biological Sciences Research Council (Alert 13 and Alert 14 awards), Medical Research Council (Next Generation Optical Imaging Initiative), UK Regenerative Medicine Platform (Safety and efficacy, focussing on imaging technologies) and the European Commission (Joan Comenge currently holds a Marie Curie Fellowship).